Joseph Millson will be Henry V at Grosvenor Park Open Air Theatre! Joseph Millson confirmed as Henry V at Chester’s Grosvenor Park Open Air Theatre this summer. The Last Kingdom actor will perform as the warrior king in Loveday Ingram’s Henry V between 26 July – 25 August. This summer marks the ten-year anniversary of the award-winning theatre, produced by Storyhouse. Joseph may be best known for long running stints in television programmes such as The Last Kingdom, Banished, Holby City, The Sarah Jane Adventures, 24 Live Another Day andCampus. Along with guest starring roles in many more including Catch 22 for George Clooney, Talk To Me, Survivors, Penny Dreadful, Ransom, Ashes To Ashes, Enid, Eastenders, New Tricks, Grantchester, Midsomer Murders. An experienced theatre actor Millson won the 2017 UKTheatre Award for best performance in a play for The Rover (Loveday Ingram) at the Royal Shakespeare Company (where he is an associate artist). He was recently announced as Mr Banks in the West End’s revival of Mary Poppins. Other recent credits include Keith (Arcola Theatre), Apologia (Trafalgar Studios), Mr Foote’s Other Leg (Haymarket Theatre), Macbeth in Macbeth at Shakespeare’s Globe theatre, this production was subsequently filmed and has been screened in cinemas worldwide, Much Ado About Nothing, King John, Spanish Golden Age Season (RSC/West End), Every Good Boy Deserves Favour, Rocket To The Moon, Pillars Of The Community (National Theatre), The Priory, Fear And Misery (Royal Court), Love Never Dies (Adelphi Theatre, winner Best supporting actor in a musical WhatsOnStage Awards), Judgement Day (Almeida Theatre), As You Like It (Peter Hall Company – Ian Charleston Award), Richard II (Steven Berkoff Company), Hamlet (Stafford), also many other seasons and productions with and for Royal Exchange Manchester, Old Vic, Donmar Warehouse, Shared Experience, Glyndebourne, Watford Palace and several National tours . Feature films include starring roles in Tango One, All The Devils Men, The Dead 2, I Give It A Year, Casino Royale, The Chameleon and forthcoming leading roles in ANGEL HAS FALLEN and DRAGONHEART VENGEANCE. Joseph is married to Sarah-Jane Potts. 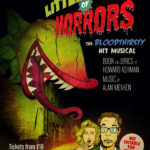 Book tickets for Grosvenor Park Open Air Theatre here.